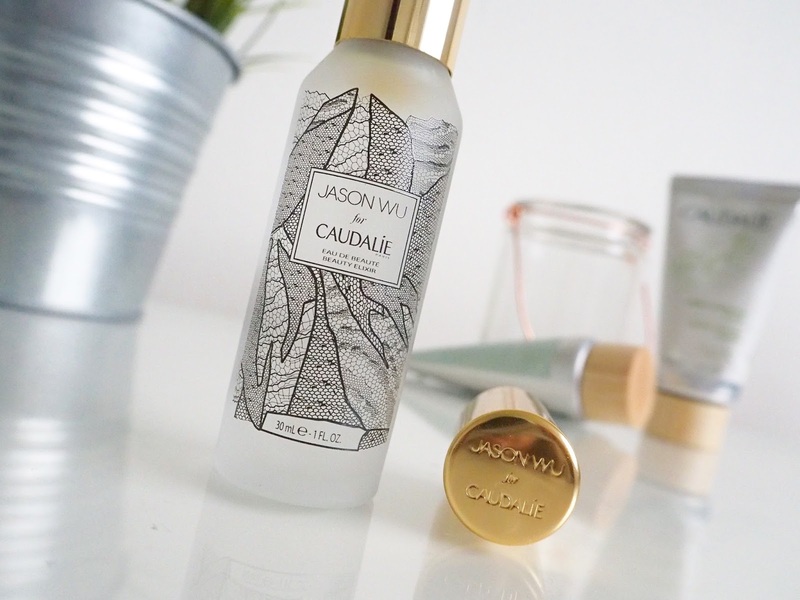 For years and years the Caudalie Beauty Elixir has been a cult product in the beauty world, and it was the product which catapulted the brand into a much wider audience with bloggers talking about it constantly. Fashion designer Jason Wu is a huge fan of the product, and always makes sure that the make up artists at his fashion shows are armed with a bottle. To celebrate his love for the brand, the two have combined and collaborated to create a limited edition bottle of Beauty Elixir. Wether you've never tried this product before, or you simply need to repurchase, now is the time to do it because look how beautiful the bottle is! The design is inspired by modern femininity, decorated with a delicate, detailed lace pattern from Jason Wu's SS16 collection and topped with light gold hardware to echo his signature accessories. The Beauty Elixir is a bit of a wonder product, with a long list of benefits; Tightens pores, sets makeup, gives a boost of radiance and smoothes fine lines. It contains grape which moisturises the skin, rosemary which helps to tone and energise and peppermint oil to refresh. The scent given off is quite minty and fresh, which with the cooling effect the spray gives makes for a wonderful pick me up on a morning, yet the herbal side to the fragrance can be quite relaxing. The mist is very fine, it doesn't leave the skin feeling wet or sticky as it sinks in really quickly and one spritz is easily enough for your whole face. I tend to use mine after cleansing each morning, before getting dressed and applying my makeup... During the warmer months when I find it harder to keep my makeup on my face, I'll switch this around to applying after my makeup to take advantage of the makeup setting promise. I jumped onto the hype of this product back in 2013 and for some reason after using my bottle, I didn't get round to repurchasing. Now that I have it back in my bathroom cupboard, I am remembering why I loved it so much. Although the smoothing of fine lines claim isn't one I have noticed yet, I can really get on board with the radiance and tightening of pores promises. I also notice that my breakouts don't linger as long on my face when I use this... Yes I still get spots, but I feel like this helps clear them up which is always a bonus for me! It's one of those skincare steps that makes quite a bit of difference to your skin, yet no difference to your routine. It's so quick and easy, literally spray and you're done. It's so easy to see why this is such a popular product. Do you use a beauty water in your skincare routine?